SharePoint Dev Ecosystem / SharePoint Patterns and Practices (PnP) February 2019 update is out with a summary of the latest guidance, samples, and solutions from SharePoint engineering or from the community for the community. This article is a summary of all the different areas and topics around the SharePoint Dev ecosystem during the past month. 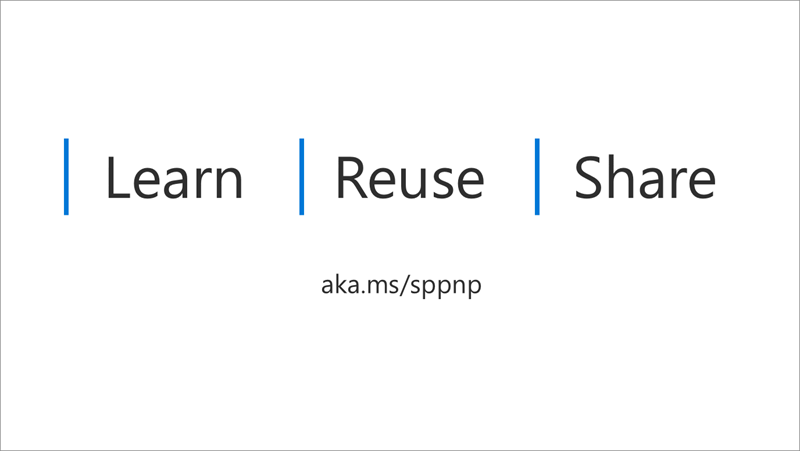 SharePoint PnP is a nick-name for SharePoint Dev Ecosystem activities coordinated by SharePoint engineering. SharePoint PnP is a community-driven open source initiative where Microsoft and external community members are sharing their learning’s around implementation practices for SharePoint and Office 365. Active development and contributions happen in GitHub by providing contributions to the samples, reusable components, and documentation. PnP is owned and coordinated by SharePoint engineering, but this is work done by the community for the community. The initiative is currently facilitated by Microsoft, but already at this point, we have multiple community members as part of the PnP Core team (see team details in end of the article) and we are looking to extend the Core team with more community members. Notice that since this is open source community initiative, there’s no SLAs for the support for the samples provided through GitHub. Obviously, all officially released components and libraries are under official support from Microsoft. You can use the SharePoint Developer group in the Microsoft Tech Community for providing input and to ask any questions about the existing materials. Most viewed articles in the SharePoint Dev documentation during January 2019. Monthly community call will get recorded and release to PnP YouTube channel typically within 24 hours after the recording is ended. If you have any questions, comments or feedback, please participate in our discussions in the Microsoft Tech Community under the SharePoint developer group. 17th of January – Updated SharePoint Framework developer training package now available (2019)! SharePoint Dev community has 3 different recurrent community calls, which you can choose to participate based on your interest and availability. All calls are recorded and published in the SharePoint Dev YouTube channel typically within the following 24 hours after the call. You can find a detailed agenda and links to specific covered topics on blog post articles at the SharePoint developer blog when the videos are published. Monthly community call – Second Tuesday of each month at 8 AM Pacific Time. Consists of the latest news, providing credits for all community contributors and live demos. If you are interested in doing a live demo of your solution or sample in these calls, please do reach out to the PnP Core Team members (contacts later in this post). These are great opportunities to gain visibility for example for existing MVPs, for community members who would like to be MVPs in the future or any community member who’d like to share some of their learnings. There are quite a few different GitHub repositories under the SharePoint brand since we wanted to ensure that you can easily find and reuse what’s relevant to you. We do also combine multiple solutions to one repository so that you can more easily sync and get the latest changes to our released guidance and samples. Following statements apply across all of the PnP samples and solutions, including samples, core component(s) and solutions, like SharePoint Starter Kit. Since the last monthly summary, we also released a new reusable training package around the SharePoint Framework. It’s targeted to be used as a self -learning training package or to be redelivered as training for anyone else. Material currently consists of 6 modules with recorded videos, hands-on-labs, and demos. We are looking into further extending this package with more advanced scenarios during spring 2019. You can use this training package material any way you prefer without a requirement to ask any permissions. We do welcome contributions on this open-source community project. SharePoint Online is continuously evolving and improving, which is a great thing for you as a consumer of the service. One of the key improvements is the availability of modern sites, which are modern Office 365 group-connected team sites or communication sites, combined with improved functionality that can be consumed from a beautiful modern user interface. There are however plenty of customers who have already existing content in the classic sites and in classic pages, which would be great to get moved on the modern experience. This is where the open-source modernization tooling will help you. New sample react-comparer allows users to compare Before and After pictures, with a draggable slider. Implements a custom file picker. Reusable SharePoint Framework controls – Reusable controls for SharePoint Framework web part and extension development. Separate projects for React content controls and Property Pane controls for web parts. These controls are using Office UI Fabric React controls under the covers and they are SharePoint aware to increase the productivity of developers. Office 365 CLI – Using the Office 365 CLI, you can manage your Microsoft Office 365 tenant and SharePoint Framework projects on any platform. See release notes for the latest updates. PnPJs – PnPJs encapsulates SharePoint REST APIs and provides a fluent and easily usable interface for querying data from SharePoint sites. It’s a replacement of already deprecated pnp-js-core library. See changelog for the latest updates. PnP Provisioning Engine and PnP CSOM Core – PnP provisioning engine is part of the PnP CSOM extension. They encapsulate complex business driven operations behind easily usable API surface, which extends out-of-the-box CSOM NuGet packages. See changelog for the latest updates. PnP PowerShell – PnP PowerShell cmdlets are open-source complement for the SharePointOnlinee cmdlets. There are more than 300 different cmdlets to use and you can use them to manage tenant settings or to manipulate actual SharePoint sites. They See changelog for the latest updates. List formatting definitions – Community contributed samples around the column and view formatting in GitHub. Site Designs and Site Scripts – Community contributed samples around SharePoint Site Designs and Site Scripts in GitHub. DevOps tooling and scripts – Community contributed scripts and tooling automation around DevOps topics (CI/CD) in GitHub. SharePoint Dev articles are surfaced at docs.microsoft.com/en-us/sharepoint/dev. Since the last release, also classic SharePoint server-side API reference documentation has been moved to the docs.microsoft.com platform. You can provide contributions to these documents by submitting documentation improvements using GitHub tooling. All of the SharePoint Dev docs are stored and surfaced from the sp-dev-docs repository. Here are new/updated articles on SharePoint Development. You can find all SharePoint Dev videos on our YouTube Channel at http://aka.ms/spdev-videos. This location contains already a significant amount of detailed training material, demo videos, and community call recordings. Here are the new demo or guidance videos released since the last monthly summary. Thank you for your assistance and contributions on behalf of the community. You are making a difference! SharePoint PnP Core team manages SharePoint PnP community work in the GitHub and also coordinates different open-source projects around SharePoint development topics. PnP Core Team members have a significant impact on driving adoption of the Office 365 and SharePoint development topics. They have shown their commitment to the open-source and community driven work by constantly contributing for the benefit of the others in the community. Thank you for all that you do! February 2019 monthly community call is on Tuesday 12th of February at 8 AM PST / 5 PM CEST / 4 PM GMT for latest release details with demos – Download recurrent invite to monthly community call with a detailed schedule for your time zone from http://aka.ms/sppnp-call.